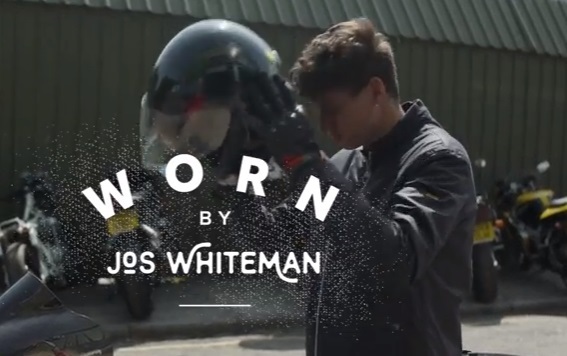 British fashion label Barbour celebrates the launch of the Autumn/Winter 2018 Barbour International Sport collection with a series of spots featuring model and bike-enthusiast Jos Whiteman. The latest advert shows Whiteman rocking some of his favorite pieces from the new collection, while being off duty. A soft short-sleeved T-shirt printed to the chest with a high-impact graphic inspired by Barbour International’s motorcycle heritage, a pair of jeans featuring the brand’s logo and a wax jacket constructed with a hardy outer and a brushed-cotton lining in Merlot Tartan, cut to a tailored fit with raglan sleeves, featuring a sit-down corduroy collar, side-entry bellows pockets and corduroy elbow patches, which is available in black, royal navy and olive, are among the items worn by Whiteman. The song serving as soundtrack is the 2018 single “Run With Me” by Barrie Gledden & Kes Loy, included on the album “ANW – 3021 Building Indie”. The collection for men also includes a biker-inspired waxed cotton jacket, with a baffle-quilted inner, storm placket and fixed hood, and four stud-close outer pockets, a windshield tailored fit quilted jacket, a quilted jacket ideal for cold weather, constructed with a large-scale baffle-quilted outer and patch pockets with side entry, a cosy sweater knitted in wool blended with cotton, featuring an all-over texture and a zip-through front with a Barbour-branded puller, a half-button sweater, crew neck T-shirts, slim fit shirts, and more. Barbour has also teamed up with Channel 5 weather presenter Sian Welby to showcase the stylish looks included in the brand’s new Weather Comfort Collection through a series of Barbour-inspired weather reports that celebrate the always unpredictable British weather. With a rich heritage dating back to 1870, when travelling draper John Barbour set up the business in the North East of England, Barbour has increased its product range, over the years, to include more than 2,000 pieces over six collections: The Heritage Collection, The Contemporary Collection, The 75th Anniversary Collection, The Classic Collection, The Beacon Heritage Collection and The Sporting Collection. In the UK, the fashion brand has eleven stand alone stores, and globally it expanded in over 40 countries, including the US, Holland, France, Italy, Spain, Argentina, Japan, and New Zealand.